The two compact pedals combine wah and volume functions. 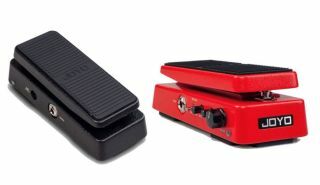 Joyo has unveiled its new Wah-I Classic Wah and Wah-II Multimode pedals. The two compact pedals combine wah and volume functions, with a minimum volume knob to adjust the heel-down level. The Wah-II features a "quality" (Q value) knob, plus a range knob to adjust the width of the sweep. Both pedals also feature bright LEDs. The Joyo Wah-I Classic Wah and Wah-II Multimode pedals are available now for $69 and $79 respectively. For more info, head on over to joyoaudio.com.